A fairly mild end to 2017 as we ran our Blue Timetable. There was a steady stream of passengers all day, including plenty of walkers. Down at the shed, a lone ranger continued with the quest to repaint the Class 33 which is coming on a treat now. As our 150th year celebration draws to a close, I thought it would be useful to reflect upon what a fantastic year it has been for our railway. We set out to make it a bumper year and I think we achieved it! We had many great events and lots of happy smiling faces through the door. It has taken a lot of effort on the part of our staff and volunteers and they have each played their part in their own way. The year kicked off with our March Diesel Locomotive Weekend, which featured a visiting Class 14 locomotive for the first time. 'Eric' was a hit with the general public and it was great to see such an unusual yet versatile locomotive running on our line. The event also featured the first services for the newly-arrived Class 31, which became a first enthusiast favourite. Something equally strange happened for the Multiple Memories Railcar Gala in May, where we had a visiting Class 153 from East Midlands Trains. It was certainly weird seeing that operating up and down the branch! The whole weekend started with a bit of a nightmare if I remember rightly. Several things went wrong with the transport of the unit which meant that it didn't land with us until midnight. We were then up bright and early for the naming ceremony as the unit now proudly wears the "Ecclesbourne Valley Railway 150 Years" nameplate. We were very grateful to East Midlands Trains for all of their help to make this weekend a great success. I suppose the biggy was the visit of the 3F 'Jinty' 47406 which delighted the visitors for a large part of the summer. 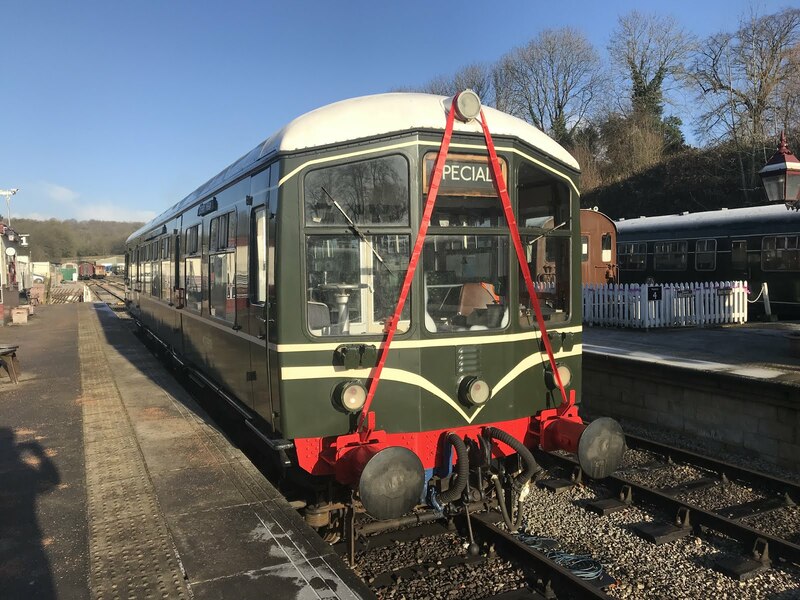 Operating over several key events including the Classic Bus and Coach Rally, the Classic Transport Weekend and the 1950s Bank Holiday Weekend, the locomotive helped us achieve several 'firsts' for our railway. For example, we passed steam and diesel services at Shottle for the first time. The 'Jinty' was so popular we then set about looking for a steam presence in 2018 and happily, we were able to secure the return of the locomotive so that we can enjoy it once more. One of the passing locomotives was visiting Class 26 D5343. This locomotive operated intensively during August and was a firm favourite with the enthusiasts. Some of whom came every single day it was operating! It was certainly a fun locomotive to have around. Finally, to cap off the season, we have just completed our busiest ever Santa season which worked very well indeed. I look forward to another successful season in 2018. The return of the 'Jinty' is fantastic! We kick off again in March after some upcoming hard work by the PWay team and the big opening event is the Diesel Weekend on 17th and 18th featuring something very special indeed – a Class 35 Hymek! None of it would be possible without the hard work and dedication of our volunteers. A Happy New Year to all! The railway was awakening today after a few days of lul for Christmas. The big event for today was the Wedding Reception of Kathy and Ian, two Wirksworth residents. They had invited all of their guests to "An Afternoon with Iris" but they didn't mention that Iris was a train! After marrying at the church up the road, they had a hot chocolate reception in our decorated marquee before boarding the train. Iris did a return journey to Duffield with the jazz band on board and fish and chips were served whilst we were at Duffield. Santa was guarding!! This morning, wagons were sorted out by the PW team before the works train tripped to Shottle prior to the wedding. The 3-car was readied for this weekend's service too. Apologies for the lack of progress reports recently. Each day has almost been a carbon copy of each other! Santa has of course been the aim of the game and after having many many happy smiling families travel on the train, the staff now deserve a well earned rest! Thank you to everyone who has helped with Santa this year; our most successful year to date. Another three Santa Experience trains successfully completed with many happy visitors, including a local nursery. The Maintenance Team spruced up Iris, especially the roof domes ahead of a wedding reception we are hosting next week. Other than that it was relatively quiet on site today. A damp and wet day but it didn't alter the spirits as we tackled four Santa trains today. 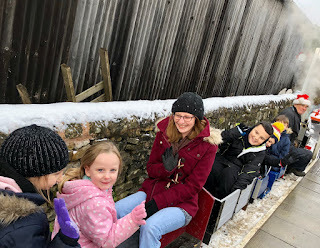 There was originally only supposed to be three trains today like on other days but we had to add an extra one due to last Sunday being postponed due to the snow. Four Santa trains really does take it's toll on the volunteers and I would like to thank them for sticking with it and battling through. I would actually liken the train turnaround to that you would find at an airport - train in, passengers off, sweet through and present sought, change platform and boarding begins, all in about 15 minutes sometimes. There were some engineeringy type people down the shed, including the Faraday team, the BSK(K) team and the 33 Van Gough. Unfortunately, being tied to the Booking Office desk most of the day, I didn't get chance to pop down and see what they were upto. Our Santa Experience was back underway today with three completely full trains for the team to delight. Everyone seemed to enjoy themselves and so I thank the team for their hard work all day. It takes a large number of volunteers to pull off just a single Santa day! A few were down in the Maintenance Facility with ETH conduit being fitted to the BSK(K) and further bodyside sanding on the Class 33, which must seem enormous when being attacked with a sander. It must have been the quietist Tuesday of the Year with the Steam team having their Xmas lunch. Today was our first day of Santa Experiences and we were extremely busy. Yesterday's snow helped to make our stations look very picturesque which I'm sure offered great photo opportunities for our visitors.The music in the Santa marquee together with our travelling musician and magician ensured our guests were entertained from the minute they entered Wirksworth station until the arrived back from their trip to the North Pole. The volunteers who decorated our stations did a wonderful job especially the Christmas trees. The 'snowing' Christmas tree at Duffield station was a constant source of amusement to both young and old. Many thanks to everyone who participated in delivering a really first class Santa experience to all our guests. A special mention must go to our young team of fitters who were on hand to assist with departures and arrivals on platform one as well as ensuring passenger areas were cleared of snow. Just after the 12.30 North Pole departure Wirksworth station suffered a power cut due to a blown fuse in our main supply box. Ironically at one point we had three Western Power employees on site and the defective fuse was replaced in no time by our own electrical contractor. 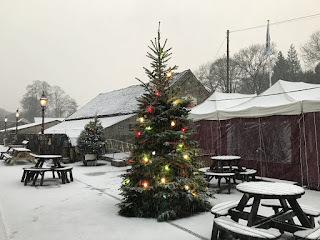 The weather has been a constant source of worry and late afternoon following an update from the Met Office a decision was taken to postpone tomorrow's Santa experiences. Our visitors, staff and volunteers safety is our primary concern and with this in mind it was felt postponement was the only option bearing in mind the 8-15cm snow fall predicted in our area between 04.00-10.00 on Sunday. Leigh spent a busy time telephoning our pre-booked customers and re-arranging bookings for the three replacement services which have been scheduled. The Catering Staff tried out a new afternoon tea menu to a group of more than willing volunteers with very positive feedback. The Miniature Railway provided a steam hauled service this afternoon much to the delight of our younger visitors and the EVRA shop was open on platform one. 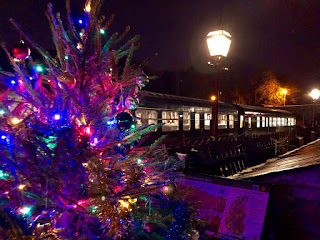 This evening a special Carol service train will be journeying along the valley. This is a free train service for our local community to enjoy organised by Neil F.L. Thanks to the train crew and Ben for giving up their time on a cold, dark winter's evening to help ensure the success of this innovation. It seems winter has arrived as we put the final preparations in place for the start of the Santa season tomorrow. A little covering of snow is welcome as it adds to the festive atmosphere but we are watching the forecast quite closely as the threat of more significant snowfall looms for Sunday. Not too many on site today. Derek and Dan continued with the BSK(K) and Lee carried on with just the BSK. Theme here? Ben looked a leak on the Santa train's toilet which was most useful. Not quite as cold as in recent days which was good because there was a flurry of activity around Wirksworth Station as we decorated for Santa. The Santa flag is now flying which means it must be Christmas. There was a moment up at the main gate fixing the light above the EVR sign which has been out of action sometime. This now has a ambient light sensor on it so it becomes illuminated whenever it goes dark. The adjacent light above the gate had it's PIR repaired so that now works again. In the shed, work continued on the preparation for repainting the Class 33. Those roof grills are most frustrating to sand! Coach work and work on The Duke also took place.